Demonstrate the different sounds of a turkey by using the turkey calls. Important — Do not allow children to try the turkey calls, due to the fact that germs can easily inhabit the calls. 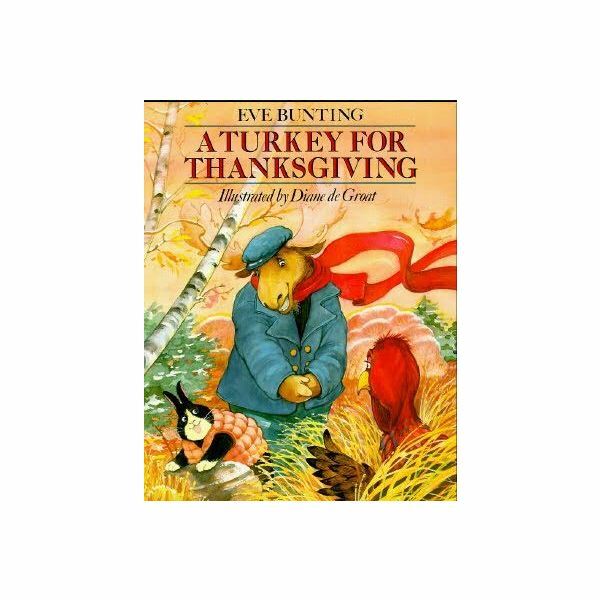 Read the book, A Turkey For Thanksgiving by Eve Bunting. Discuss the events in the story. Instruct the children to paint the underside of the paper plate brown. Allow children to choose the feathers that they wish to put on their turkey. Fold plate in half, brown side facing out. Use hot glue to adhere the feathers to the rim of the paper plate. Place dots of glue randomly around the opening of the plate, instruct children to hold plate firmly together until dry. Note: To avoid burns, do not allow children to use the hot glue themselves. Cut out the shape of a turkey's head from the brown construction paper: A turkey's head should look like a small peanut. Cut out a triangle and a small peanut shape from red construction paper. This will be the beak and the gobbler of the turkey. Colored tiles, in this math skill, are reminiscent of the colorful feathers of the turkey. Give students small tubs or dishes. Fill each dish with colored tiles. Children should arrange colored tiles in patterns of 10. Teach children to count by tens. Write the word Thanksgiving vertically on a chart. Ask the children to think of a word or words describing Thanksgiving by using the letters of the word.